I’ve been pretty lucky to be only 24 and to have had birthdays in so many different places. 16 in San Francisco , 19 in London , 22 in Shanghai , 23 in Laos , 24 in Shanghai again. I’m pretty sure there have been some other birthdays around places in the U.S.A but its been lost to the mists of time. This year in Shanghai I wanted a beach. And a beach I would get! 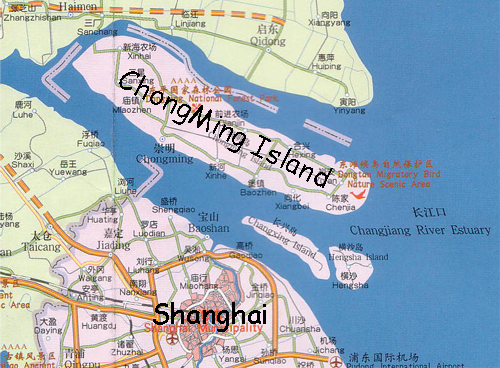 Hardily scouring the internet for clues, I decided on Changxing island. Jinshan beach was last week. I wanted a new adventure. There is quite a dearth of English language information available on Shanghai’s northern islands but I found a site that was promoting some good beaches with pictures of smiley happy people enjoying the sun. Sounds good, right? I ignored the more commonly gone to island (Chongming Island) that actually has some articles (in English *gasp*) on it, and a developed infrastructure in favor of the wildcard Changxing. I was pretty excited at this point. I’ve been meaning to visit the islands for a long time now. It’s the only district of Shanghai I haven’t been to yet. I’m a nerd like that. Gotta collect em’ all! Before October 31st , 2009 , the islands were only accessible via ferry. Now a 25.5 km (15.8 mi) tunnel bridge complex exists. Take the 8.9 kilometer (5.5 mi) tunnel from Shanghai’s Pudong district to Southern Changxing island and then bridge over to Chongming. Eventually the city plans to connect the islands into the metro system. As one can imagine , the opening of the tunnel and bridge have jump started developments on the islands. This all fit into my imaginings of the new beach resorts I had seen on the internet. Emerging from the tunnel onto land, we were greeted by towering apartment construction zones and other signs of development. As the bus pulled into the station we greeted by another beast -touts. Holy Guacamole! The bus hadn’t even opened the doors yet and people were slamming into the sides of the bus , trying to shout through the closed windows , offering the “best” price for wherever it was you wanted to go on the island. If you aren’t used to this kind of thing it can be extremely intimidating. Add the fact that we were foreigners and the tout’s excitement level were up tenfold. We found a guy who said he knew where the beach was and would take us there for 20rmb. We hop in his car and we speed off in search of our destination. By speed , I really do mean speed. This guy was laying on the horn and the gas pedal the entirety of our trip. Seeing as we didn’t crash, I’d say the trip was worth the 20rmb of pure adrenaline we had flowing through our veins. We passed through a pleasant shaded street lined with large pine trees and people fishing in a street next to the road. We emerged from the wooded zone out into a small street with a stunning vista of … huh The Bridge to Chongming Island?? This was warning sign number 2. Um ok , interesting location of the beach but whatever. Look at the architecture of that bridge! One helluva bridge! We get dropped and and go over to the wall separating the road from the beach and we are rewarded with a rocky coastline , brown muddy water , and not a speck of sand in sight. Off the distance we see a little break wall stretching out into the water and it looks like people are in the water. “It’s gotta be over there!” Says I , hope pretty much drained out. We get to the break wall and indeed there are a good 12 or so people playing in the water. This is where the final warning sign comes , in the form of a warning sign. “Hmm , the Chinese characters here say “Dangerous , do not go swimming in the water”. “Screw it , it looks like they are having fun and we came all this way”. After about 10 minutes of wading in the water , being careful not to go past knee deep we decide that perhaps the trip is salveagable if the driver will take us across the bridge to Chongming Island and we can chill out at the national forest park or the wetlands park there. My girlfriend calls the driver and hearing her response to his price , “What! You want how much just to go over a bridge?!? !” we scrap the plan and hightail it back to the bus station and make a beeline back to the comforts of the city. Back at home , I re-checked that Changxing Island tourism website and after 15 minutes finally found the info I was looking for – Changxing Island , Dalian (Dalian being a northern Chinese city) – this little nugget of information being conveniently hidden in tiny print in the corner . Great. 1. Don’t go to Changxing Island , just don’t. 2. Aimee and Laura , you gals are awesome! Lesser folk would have murdered me for much less. 3. Chinese internet sites aren’t the best designed. Be careful everyone or you may end up like me! Next time , follow my misadventures as I searches for fun places! In the quest for the beach , Sihanoukville was the next stop after Phnom Penh. Sihanoukville is a small place without the hustle and bustle of Phnom Penh and without the history of Angkor. This town was carved out of the jungle in the 1950’s after Cambodia gained its independence from France. The ruling prince of the country was named Sihanouk hence the name Sihanoukville. The location was perfect for Cambodia’s first deep-sea port. Access to the Gulf of Thailand facilitated trade and helped to build up the economy. The beaches and business money attracted the rich and elite to Cambodia. That is until the Khmer Rouge decided that having money was a retarded idea and that everyone should collectively grow rice that the party leadership would then sell to buy more guns while everyone starved. Woo hooo! The 7 story Independence hotel was subsequently used for target practice and the beaches remained empty. Empty until the 90’s when the bandits along the road were eliminated and tourism started bringing back cash into the country. Now construction is booming in the city and new hotels are sprouting up everywhere. With the good aspects of tourism comes the bad as well. Tuk-tuk drivers have a big price collusion scheme going on ($15 to Otres Beach?!?) and you can see the common examples of Westerners behaving badly. C’mon dude!, that girl is half your age and 1/3 the weight!!! I spent my entire time on Otres Beach and loved every moment. There are several different beaches that you can take a tuk-tuk in-between but Otres was just the place for me. The entire beach is lined with guesthouses , and some chill out restaurant/bars. There is also a dive shop and little stores with everything one needs (except an ATM). All accommodation was fully booked here during Chinese New Year so definitely book ahead during peak travel times. There are more expensive beach bungalows as well as dorm style lofts. I really recommend Mushroom Point. Cozy , intimate, little bungalows with an awesome hammock lined common/bar area orientated towards a TV. Wake up , get a nice breakfast , and then walk 30 seconds to the beach. Swim for a bit and then have a few $1 beers. When we went to check-in the guy working at the bar was smoking a joint. He gave us our key and led us to the bungalow all with joint in hand. I knew that this would be a chill place. One day on a stroll towards the end of the beach we encountered a big , lit-up sign proclaiming Joints $1.50 , Happy Pizza , and at the bottom of the sign , All You Can Eat Indian Food. I guess working your way down the menu leads to Indian Buffet! Haha. While the beaches are nice they don’t match up to some of the nicer beaches in South East Asia. The Philippines had the palm tree white beach perfection that I’m talking about. Cambodia does have this though and it just takes a 2 hour boat ride from the port of Sihanoukville to the islands in the Gulf of Thailand. I picked out Koh Rong (Monkey Island) for the next spot. We took an afternoon boat over to experience the pure island tropical bliss. Monkey Island is a small island with a few guesthouses and kilometers of amazing beach. My accommodations got a little messed up but instead of the $20 a night bungalow we scored a private room for $5 a night. It seems like the island is being capitalized on now. New guesthouses are being built on the beaches alongside the local fishermens houses. The fishermen and sea all around lead to awesome seafood. Fresh squid and fish for super cheap abound on the island and I took full advantage of this. This island is amazing and I didn’t even get to see what is claimed to be the best beach on the island. It was closed off for the filming of French Survivor while I was there! The best part was yet to come though. At 2am after a little bit of drinking and hanging out partially with the non-English speaking Russians (that’s always fun) the cool Germans I had been hanging with for a bit said to me , ” Have you jumped into the water yet? It’s life changing.” “Let’s go”. This was after hearing a very drunken Russian lady saying “Stars above and stars below!!”. Hmmm , what was in store? We jumped off the main pier on the island , the one nearby to all of the guesthouses, and landed in A Starry Night by Van Gogh. Every single movement of my body triggered an explosion of comets in the water. Bio-luminescent algae floats in all these waters and when disturbed they light up fireflies. I looked up at the sky free of light pollution with hundreds of glimmering stars and out of my downward peripheral vision I caught dozens of glimmering stars in the water completely surrounding my body and bursting forth after every kick off leg and movement of arm. I was completely lost in this moment. Absolutely incredible. I did not want to leave this beautiful place and the Germans I met there had just found jobs in guesthouses and were planning on staying 6 months. Arghhhh soo jealous!! For me it was time to take Aimee back to Phnom Penh to catch her flight back to China while I was heading to Siem Reap. Enjoy the photos! Usually when I visit a country I make a reservation for a hostel/guesthouse for the first night upon arrival and then take it from there. It’s nice to give an address to a driver and not worry about finding a room in a city you’ve never been too with people speaking languages you don’t understand, while carrying a heavy bag and most likely being exhausted from the plane rides and layovers. That peace of mind comes in real handy when you are just trying to enjoy the first taste of the air while on a motorbike in a new country. I like the freedom of not having a set travel plan. You meet people , ideas change , places are recommended. For the first week ;however, my girlfriend (traveling outside of China for the first time) was pretty adamant about booking places in advance. She didn’t yet understand the way backpacking works and was a little nervous about coming.. We had our plans and stuck with them but the second week was totally improvised and I’m very glad it was that way. I befriended a local guy , Bunthy, and he ended up showing me his home village outside of Phnom Penh and we made the trip to Angkor Wat and Battambang together. It wouldn’t have worked out like that if I had a schedule to follow. Anyways, back to the first week. Aimee didn’t really have much time and I wanted to take her to the islands and beautiful beaches of Southwestern Cambodia. (She has never been to the ocean or to a beach). So we landed in Phnom Penh in the evening , caught an afternoon bus to Sihanoukville the next day , spent the day after enjoying the beaches of Sihanoukville , then hopped aboard a boat for a two-hour trip to the island of Koh Kong (Monkey Island), we lazed about on the beach for 2 days and then it was time to head back to Phnom Penh to get Aimee on her airplane back to China. The second week I started out by hanging out in Phnom Penh for a few days and met my Cambodian friend. We went to his village outside of Phnom Penh to get a taste of the rural life and then went up to the tourist mecca of Siem Reap and spent 3 days exploring Angkor and going on a boat ride in the Tonle Sap river through the flooded forest of Kampong Phluck and seeing the nearby floating village. Originally , I planned to make a quick back to the coast and spend my remaining days in the beach town of Kep but the 12 hour bus ride to get there kind of put me off that idea. So we continued on the way to loop around Tonle Sap Lake visiting the city of Battambang to ride the bamboo train. The last day saw a 6am bus ride back to Phnom Penh and savouring the last warm blue skied day for a while. Obviously there is much more to the country that I would love to go see but I feel I got a decent glimpse at the country. 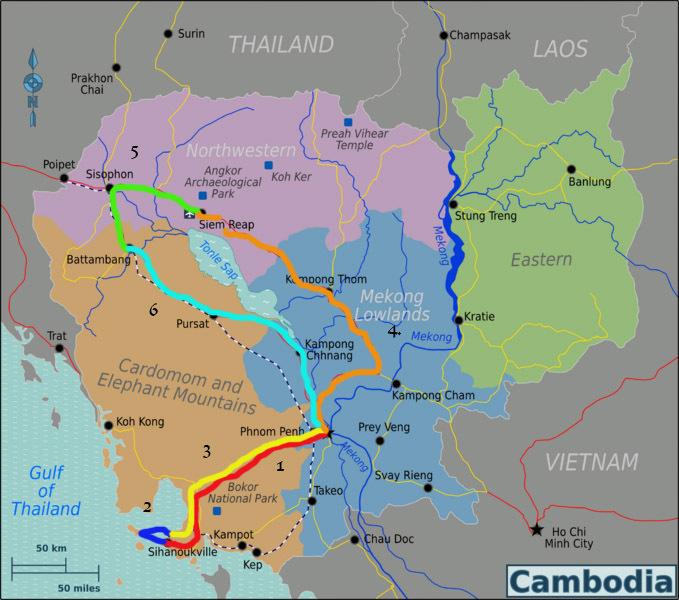 In the future I would love to visit Koh Kong , Kep , and venture into the rural Eastern section of Cambodia.